U. COLORADO (US)—Gravity always wins, one might think. Avalanches roar and skiers plunge inexorably downhill. But moguls—or bumps, as skiers know them—move uphill. Just ask Tad Pfeffer, a professor of civil, environmental and architectural engineering at the University of Colorado at Boulder; David Bahr, a Regis University professor and former CU geological sciences student; and Ray Browning, a professor at Colorado State University and former CU integrative physiology student. The three teamed up to confirm their hunch that moguls move uphill. The results of that work were published in Physics Today. As the researchers note, skiers cruise down fresh slopes, unimpeded, turning whenever they choose. With each cut, with each calculated turn, they push snow into small piles. These piles build over time, creating “bumps” that can’t easily be ignored. To save knees and ligaments from damage, skiers turn on the underside of moguls. The process causes the moguls to migrate uphill. Each skier who traverses the mogul field adds new snow on the uphill side of the bumps and shaves some snow off the downhill side. Essentially, this pushes moguls up the hill. This process of “backward propagation” is not unique to moguls. “Moguls are a type of kinematic wave, an entity rather different from the more commonly studied dynamic wave,” according to the study. “The classic example of kinematic waves, and the setting in which kinematic wave theory was formulated, is the flow of cars on a highway,” says Pfeffer. 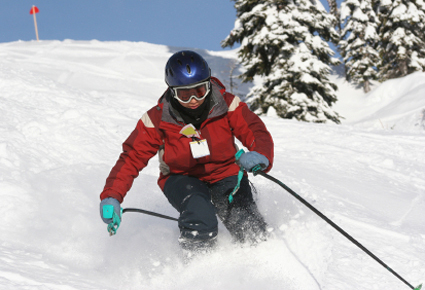 The study found that moguls move uphill at roughly 8 centimeters a day, or about 10 meters a season. Photogrammetry uses photographs to measure objects, in this case the distance moguls travel uphill. When the project started, Pfeffer was just starting to work on time-lapse photogrammetry, a process he now uses for his work with the Extreme Ice Survey, which uses time-lapse photography to document the retreat of glaciers worldwide.